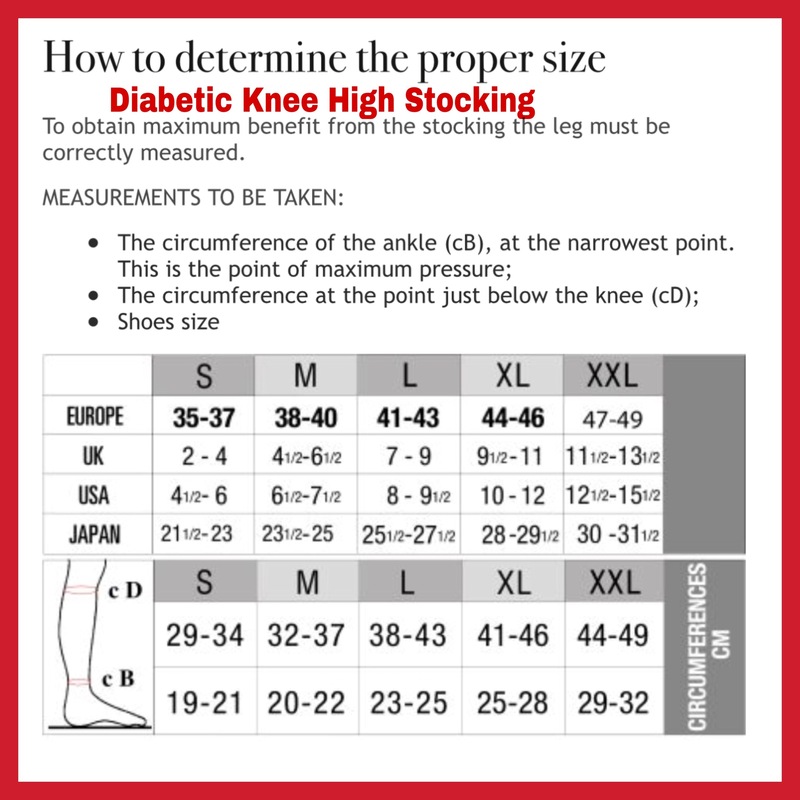 Knee-highs made with a very fine weave that makes the fabric extremely soft, lightweight and breathable, with a slight compression that makes the stocking adhere well to the leg. Toe stitching is done specifically outside the stocking so the fabric inside that is in contact with the foot, is flat, smooth and soft, to avoid friction that may injure the skin. Made of COOLMAX® quick drying yarn to keep the skin of the foot, and the limb, cool and dry, thanks to excellent, body moisture management. Perspiration is conveyed outside for optimal comfort, maintaining prolonged freshness together with excellent breathability. The characteristics of this knee-high sock are suitable for diabetics with peripheral arteriopathy and/or neuropathy, in primary or secondary prevention and for non diabetics with fragile skin. The Diabetic knee-high sock does not replace the knee-high sock or the elastic stocking in patients with venous disease nor the "anti-thrombus" stocking in operated patients or undergoing operation. The diabetic foot is one of the complications caused by diabetes. Diabetesis a chronic metabolic disorder associated with high glucose levels in the blood, a condition known as hyperglycemia. Over time diabetes leads to numerous and serious complications, one of the most common being a condition called the "diabetic foot". We speak of diabetic foot when the damage done to the arteries (diabetic arteriopathy) or the nerves (diabetic neuropathy) in the lower limbs affects the function and/or the structure of the foot. Diabetic patients must turn to their diabetes specialist and ask about the condition of their feet in order to prevent this dreaded chronic complication. And they must keep to a series of recommendations including paying great attention to the stockings they wear. The stockings must have a wide closed sole and must not squeeze the foot. And above all it is important to pay attention to seams. Seams must be flat so that the fabric inside in contact with the foot remains flat, smooth and soft, preventing friction that could cause injuries to the skin. It is also important to always keep the skin of the feet and legs perfectly dry in order to avoid maceration. 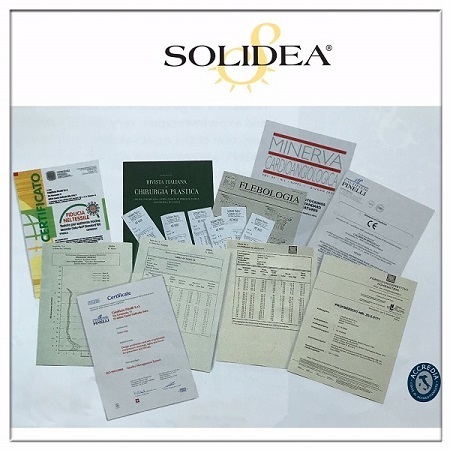 Our product research efforts have led to Solidea’s DIABETIC LINE that fully meets all the needs posed by this pathology. Toe stitching is done specifically on the outside of the stocking so that the fabric inside, in contact with the foot, remains smooth to avoid possible friction of the patient’s fragile skin. COOLMAX® yarn is used, quickly keeping the foot and leg skin constantly fresh and dry. Thanks to its excellent body moisture management it conveys perspiration outside, offering optimal comfort and maintaining prolonged freshness together with excellent breathability. 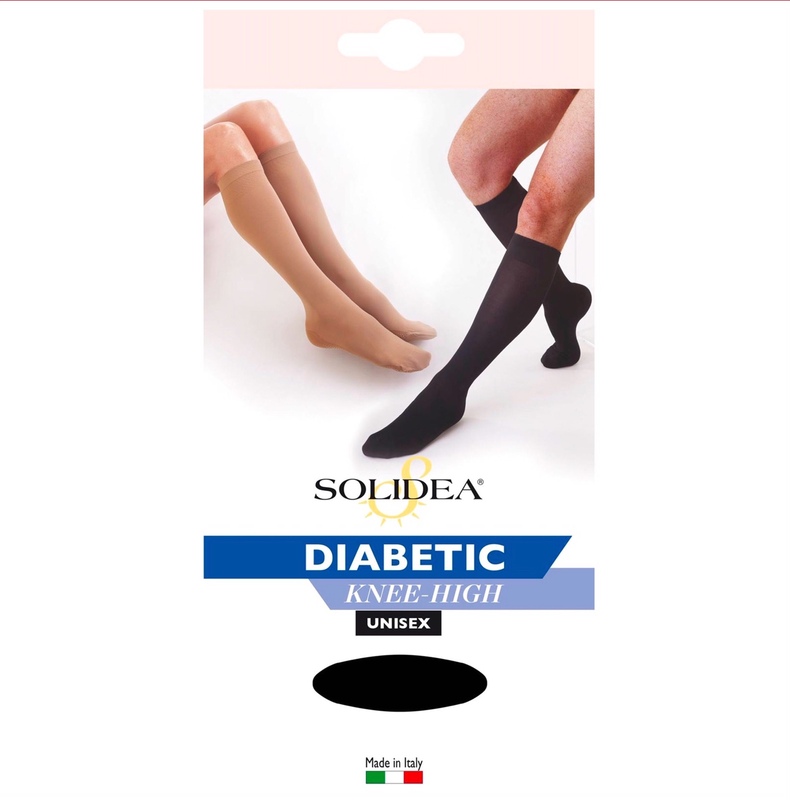 Light compression makes the products of the DIABETIC LINE suitable for diabetes patients with peripheral arteriopathy and/or neuropathy. The very fine weft of the fabric and the light and soft fabric adheres very well to the limb. Stokin yang ditenun sangat halus ini menjadikan ianya sangat lembut, ringan dan memberi keselesaan maksimum apabila dipakai. Mempunyai sedikit sahaja tekanan (compression) bagi memastikan stokin ini tidak mudah bergerak tetapi tetap selesa ketika dipakai. Jahitan di bahagian jari dibuat di bahagian luar supaya bahagian dalamnya rata, licin dan lembut bagi mengelakkan geseran yang boleh mencederakan kulit. Diperbuat dari benang Coolmax yang cepat kering bagi memastikan kulit sentiasa kering dan selesa tanpa rasa panas. Diabetes adalah gangguan metabolik kronik yang berkaitan dengan paras glukosa tinggi dalam darah, suatu keadaan yang dikenali sebagai hiperglikemia. “Diabetic Foot” ialah salah satu komplikasi yang berlaku akibat diabetis. Ia berlaku apabila berlakukanya kerosakan pada arteri atau saraf di bahagian bawah anggota badan terutamanya kaki. Pesakit disarankan berbincang dengan doktor untuk mengelakkan komplikasi ini dari berlaku. Salah satu cara untuk mengelakkan komplikasi tersebut ialah memakai stokin yang bersesuaian setiap hari. Menggunakan benang Coolmax yang memastikan kulit sentiasa kering dan segar. Tekanan yang lebih ringan, sesuai untuk pesakit diabetis yang mempunyai komplikasi pada arteri dan saraf. Fabrik yang sangat halus dan lembut bagi keselesaan kaki.